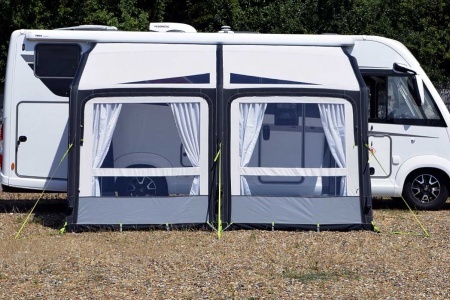 The Kampa Motor Grande AIR Pro 390 is a new addition to the Kampa Motorhome range for 2019. 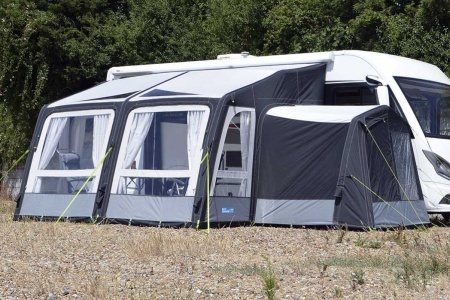 It incorporates all the advantages of Kampa's famous Rally AIR models that have made them Europe’s favourite inflatable awnings, but with a huge three metre depth; this, along with Kampa's Dual-Pitch Roof System, ensures you can utilise the entire awning, giving the Motor Grande AIR Pro 390 a remarkable 11.7m2 of usable space. Behind the right-hand side window is a large secondary mesh panel, providing relief in hot weather. Further secondary mesh panels can be found behind both side doors and additional ventilation can be added to the front of the awning with Kampa's optional front mesh panels. Both side panels are interchangeable allowing for the reversal of the side doors and either or both side panels can be replaced with an optional annexe or conservatory. 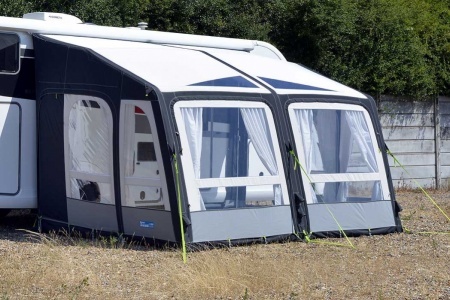 The Motor Grande Air Pro is a 'static awning' - that is it cannot be used freestanding - if you just want to stay put for a while, Kampa's static awnings will fit the bill. 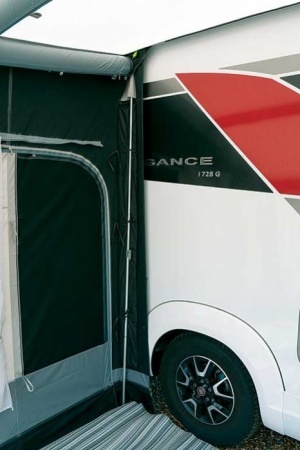 They attach to your vehicle by either connecting to a roll-out awning or to an awning rail fitted directly to the vehicle. All models come complete 4mm and 6mm keder beading making them ready to fit most popular roll-out awnings. They also come complete with specially designed rear upright poles that keep the rear of the awning close to the side of your motorhome. The main material that the awning is made from is important and the Motor Grande Pro is no exception. This awning uses Kampa's Weathershield Pro fabric, that is used on a great deal of their awning range. It has a proven track record, with its strong durability and high value weatherproofing. Despite these qualities it remains lightweight and manageable - great for easy set up and handling. 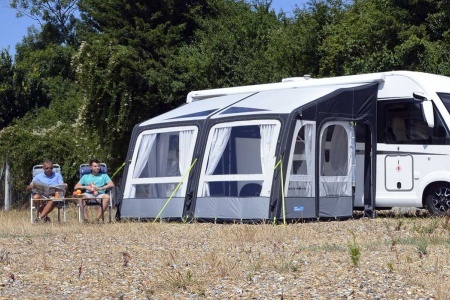 Kampa have also made improvements to the UV protection and the coatings to make sure that Weathershield Pro continues to function well as an awning material. The Motor Grande Air Pro 390 is also what Kampa call 'Sabre Link Ready'. The SabreLink Link System provides effective lighting to your awning. You can link up to three light strips together with each strip having 150 LED lights. This is an optional extra. Seams: seams are hot air taped. New for the 2018 awning season, Kampa have developed a new roof system, giving their caravan awnings greater interior headroom. 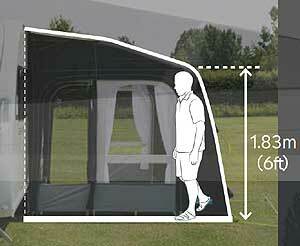 This increases the practical nature of the awnings and makes Kampa awnings even more desirable and spacious.